I write stories set in late Georgian England and the Regency period, among other things. Heroes in such stories inevitably have some connection to the Napoleonic wars, either the army or the navy. Americans often forget that what we call The War of 1812 was in fact, a smallish part of a bigger fight, one that could be described as a world war. A writer can’t research that period without tripping over Horatio Nelson. If you’ve been to Trafalgar Square in London, or to Nelson’s tomb in Saint Paul’s you have some idea of the reverence with which Admiral Lord Nelson is held in British history to this day. The Battle of Trafalgar broke the back of the French navy at a crucial point in the Napoleonic wars. Napoleon’s land forces went down to defeat ten years later before his ambitious shipbuilding efforts could rebuild naval capability. Britain dominated naval power for the remainder of the century, at least until the end of the age of sail. Dominated? There was one modest defeat. I confess that I once sat at dinner with a friend and argued that the British loss off Sandusky, Ohio, eight years later was every bit as great a loss as Trafalgar was victory. Why? When the cannons stopped the Americans had control of Lake Erie and therefore, arguably, the upper Great Lakes. The most immediate consequence was that the British could not supply Detroit and were forced to abandon it. They retreated into Ontario, pursued by General (later President) William Henry Harrison and surrendered at the Battle of the Thames, an engagement that took the life of the great Shawnee ally of the British, Tecumseh. Longer term, control of Lake Erie meant that when the peace negotiations concluded the United States retained control of the lands south and west of the lake—Ohio, Michigan and strategic trading posts at Maumee and Detroit. They secured control over the passages to the west for settlement. exactly the full force of British might. 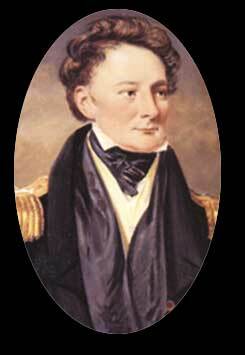 Robert Barclay, a one-armed veteran of Trafalgar was in his first command. He was not Nelson—not even close. Still, the infant American navy took on representatives of the most powerful navel force on the planet with a force equal in some ways but weaker in others and won. The British force, for example, included two ships (fully rigged, four-masted, heavily armed). Perry’s flagship by contrast was a light two-masted brig, the Lawrence, built earlier that summer at Erie, Pennsylvania. The British had more guns but fewer men. During the battle the Lawrence was reduced to a wreck. Perry took his personal pennant and had himself rowed to the Niagara while the Lawrence surrendered. He regrouped his forces, turned, and attacked, sailing directly into the line of fire. The Niagara shot down a topsail and is believed to have blocked the wind, causing the two British ships to collide, tangling their rigging. Perry continued to hammer at their forces until they surrendered. That “personal pennant” that Perry took with him? It said, “Don’t give up the ship!” He didn’t. He arranged the surrender to take place on the deck of the crippled Lawrence. 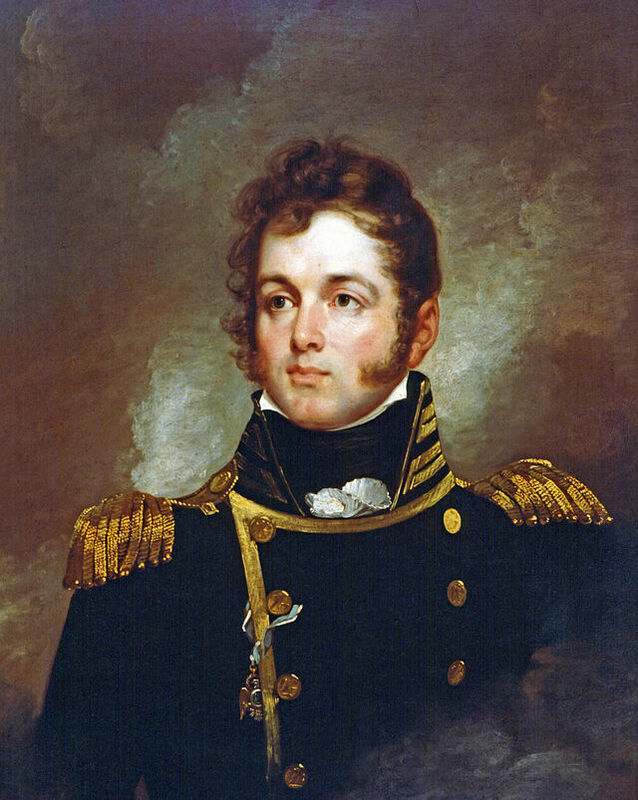 Perry immediately sent this message to General Harrison: “We have met the enemy and he is ours.” So was control of Lake Erie. Trafalgar or Lake Erie? I still argue the second mattered most in my world. Those Regency romances frequently glorify the heroes of the Napoleonic Wars. American historical romance should do the same. 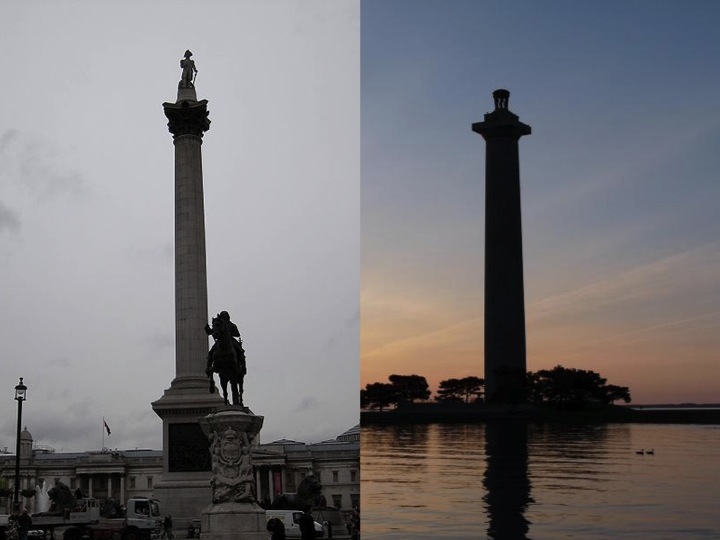 Here are the Nelson Column and the Perry Victory Monument. Similar, aren’t they? Nice post, Carolyn. My brother and I were at Put-In-Bay a few years ago on Perry’s birthday. I’ve been fascinated by the Battle of Lake Erie ever since. Thanks for doing the research on this. I may take you up on your suggestion and glorify a hero from this war in one of my books. Fascinating, Caroline. As the child of an ex-British colony, I grew up on stories of Waterloo and Trafalgar. In researching the era I’m writing about, I’ve heard of the war of 1812, but not from the ‘other’ side. I can see where this little battle would be obscure for those of you in the antipodes but from the viewpoint of Ohio and Michigan history it is a very big deal. Since I lived in the first for over 40 years and was born in the second, its a big deal to me . A BIG YES, sister, to “glorifying” Commodore Perry and the American Naval victories in the War of 1812! 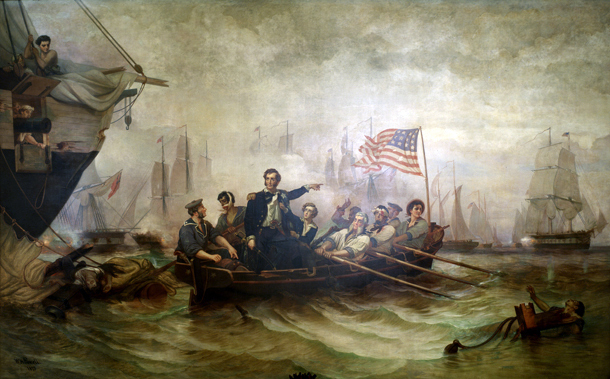 The fighting on the Great Lakes was brutal and most strategic. The victories, as you point out, gave America part of her Northern Border with Canada. No small thing! This was THE War that defined, and refined, our American Navy into the fighting force it has become. “DON’T GIVE UP THE SHIP!” still applies. Thanks Marylou. I’m the sister of a Navy pilot also. Go Navy! Great post, Caroline! Even Americans are prone to overlook the War of 1812, but historians often refer to it as the second war of American independence. Perry’s victory was then and remains to this day a remarkable David vs Goliath triumph. I bet that you have an ancestor or two who earned veterans’ pensions for service in that war. I know I do. Actually, my husband does. In 1812 mine were either in Europe, Canada, or perhaps on the other side. Those early Detroit folks walked a fine line.